Free offer full legal license key iolo System Mechanic 18 Standard edition. The promo is not for iolo System Mechanic Pro. Grab free registration code on the giveaway page. The license key is active for 6 month only (not 1-year). Version given is the latest iolo System Mechanic 18. Iolo System Mechanic Standard can repair many common problem on PCs. This utility can tweak PC to run smoothly and faster. 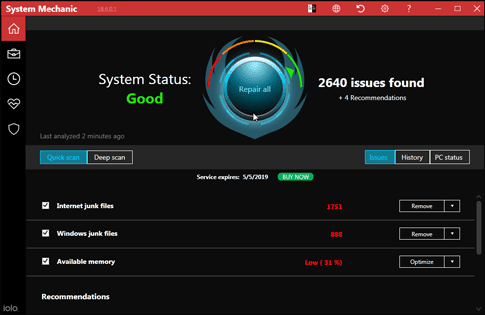 New version iolo System Mechanic features with better junk file cleaner, registry repair & cleaner, tweaking and PC repair. Price full license key the software is $49.95 but on this giveaway download the full software without any cost. On the Computer Shopper one-week giveaway, download it for free. You may need an account to download. Giveaway Page Iolo System Mechanic Standard: Visit the Page! Promo for a short time until April 14th, 2019. Everyone eligible to download full registration code for free. To receive your personal license, visit the offer page above. Click on login or create new account to login. Click on “Get Serial Code to view your personal activation code. Download the installer and use your personal license to active. New version iolo System Mechanic 18 can fix and speedup PC with system Windows 10, 8.1, 8, and 7. It can repair many issues on the PC. After free offer expires, you can get full license key using coupon code. Get 60% discount using System Mechanic coupon. Get full support and free update for paid version. Promo also for a short time.